The SMW4HV shirt is constructed of flame-resistant fabric with 360-degree visibility and 2-inch FR silver reflective striping. It is ANSI 107-2004 and ANSI 107-2010 Class 2, Level 2 compliant. The shirt also features two chest pockets with button closures, a sewn-in pencil stall and button-front closure. 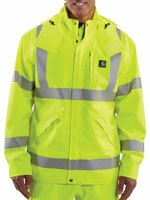 This ANSI Class 3, Level 2 compliant jacket will keep you dry in wet conditions. It features a polyester shell, waterproof membrane, fully taped seams, interior stretch polyester storm cuffs, and waterproof zipper closures and storm flaps. The jacket has a removable three-piece hood with an adjustable draw cord and 3M Scotchlite reflective material throughout. The M1863 safety vest fulfills all OSHA high-visibility requirements and conforms to ANSI 107-2010 Class 2. When moisture in the fabric evaporates through the hydrophilic fibers, heat is removed and the surrounding area cools down. This process can cool the wearer by 20-25° F for up to eight hours. This lightweight cotton coverall features an odorless repellency that is EPA-registered to last through 70 washings – the expected lifetime of most garments. 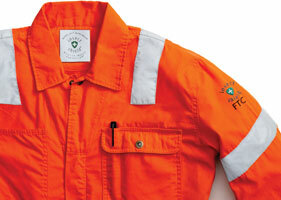 The coveralls are registered to repel mosquitoes, ticks, ants, flies, chiggers and midges. It is long-sleeved with a two-way zip front and silver high-visibility striping on the arms, legs and shoulders. These trim and reflective roll products are made to enhance nighttime visibility. The reflective roll goods can be applied to clothing and accessories to meet ANSI/ISEA 107-2010 and 207-2006 compliance. Products include heat transfer reflective films, marking films with pressure-sensitive adhesive, reflective fabric applications to sew on, high-gloss trim and vest trim materials. Developed for utility, oil and gas, and petrochemical workers, the Tecasafe FRC Vis Plus 700 coverall features flame-resistant Modacrylic fabric, 2-inch silver reflective tape for high visibility that meets ANSI Class 3 requirements, and a fall protection access port on the upper back. It has a zipper front and lower leg/ankle closures for ease of donning. This ANSI Class 2 Hi-Vis Vest is made with a durable polyester solid front and breathable mesh back. It is loaded with plenty of storage and features two lower flap pockets, a radio chest pocket, two internal lower pockets, and one chest pocket with four pen slots. Two-inch two-tone tape provides optimal visibility and a zipper closure allows easy on and off. 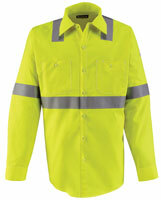 Power Dry shirts with a mid-weight base layer are fast wicking and flame resistant. The shirt features bi-component fabric construction that improves comfort by moving moisture away from the skin to the outer shirt surface, where it dries quickly. Power Dry shirts come in a variety of colors and include those that meet ANSI 107-2010 and CSA Z96-09 high-visibility safety apparel standards. 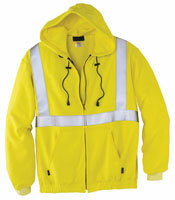 This high-visibility sweatshirt is made from Reliant fleece that meets ANSI/ISEA 107-2010 standard requirements. It has a 19.7 cal/cm² arc rating, provides a comfortable feel and holds up well to laundering. The sweatshirt has a front zipper closure, rib knit cuffs, an elastic waistband and 3M Scotchlite FR reflective material that meets ANSI Class 2 requirements.